When looking for a tree removal service, you want someone you can trust and depend on to safely get the job done right. With an excellent track record in the tree removal industry, you can count on Spears Tree Service. We specialize in backyards and difficult to reach trees. Large or small jobs, our team can take care of it for you. We are experienced in bringing trees down in tight areas, where there are nearby buildings, power lines or other obstacles we can do the job. Spears Tree Services takes on highly technical tasks. Tree removal requires well trained and qualified professionals. Tree removal addresses the health and aesthetics of your landscape as well as the safety and liability of host and adjacent properties. We may determine that tree removal is not necessary in some cases where services can be performed to allow you to keep your tree. Care and maintenance is the best way to ensure unnecessary removal and through cabling and bracing we can eliminate stress on a tree, preventing injury to it. This can also reduce risk of storm damage. See our Storm Damage Services for more information. Tree removal in urban and suburban landscapes can present a challenge. Neighborhood trees are often surrounded by other valuable plantings and structures. Urban trees can pose hazards to the public. 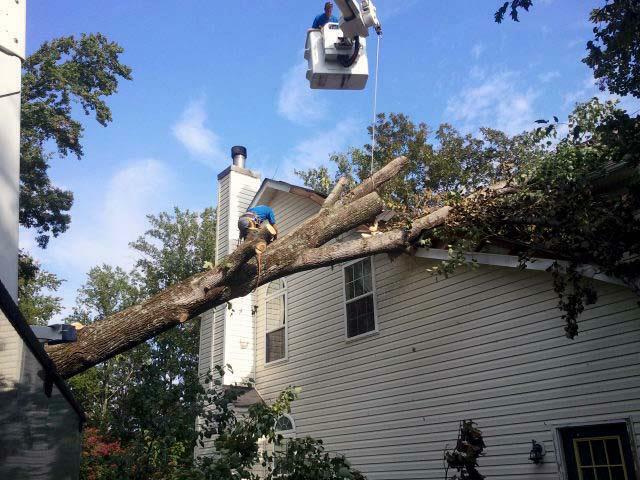 Tree removals, especially for large trees, require careful dismantling by highly trained personnel utilizing state-of-the-art machinery to ensure the protection of your home and property. Wood may be stacked at or near the base of a tree or removed from thee site. We will make the right recommendations for your property. We also can provide Stump Removal and disposal services.